The Beach Boys, that goodtime band of my youth that always seemed to personify Fun, Fun, Fun, have devolved into quite a mess. The tragic part of the story began many years ago with the loss of the two younger Wilson brothers, Dennis and Carl. The band survived, with the help of talented replacements, but it was wracked by dissention. 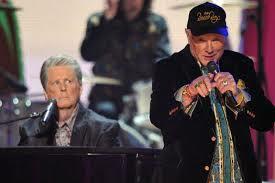 These days, first cousins Brian Wilson and Mike Love are leading separate factions. Love has been suing Wilson regularly since 1989. He’s won most of the legal battles, including the right to call his version of the group The Beach Boys. After pursuing separate paths for many years, the two combatants tantalized their fans with a 50th Anniversary Reunion in 2012, only to break up again. Is the divorce final this time? Two versions of the band are now touring the country, playing some of the same locations and many of the same songs but also presenting distinctly different visions of what the brand has come to mean. I saw both versions, Parts One and Two, in Atlantic City about two months apart. Despite their differences, they both tapped into that crowd-pleasing sense of fun, reeling off many of their biggest hits. Both bands feature longtime members of the group: Wilson has Al Jardine and David Marks in his lineup, while Love has Bruce Johnston. Brian is forbidden to call his outfit the Beach Boys. There’s some justification for this, as he’s clearly the one who has strayed from the original model, having sequestered himself in recording studios for long periods to experiment with new sounds. He also works somewhat incongruously with classic rockers such as Jeff Beck, who couldn’t be farther from the surfer mold. Mike, by contrast, has never stopped trying to be a teenager. During his show, which is especially heavy on the old car tunes, he flashes pictures of his first wreck of an automobile (Little Deuce Coup) and then his current flashy one. When he relives high school with songs like “Be True To Your School,” cheerleaders join him onstage. Both of the shows are heavy on nostalgia and evoke the good old days, but I wonder: can’t these two just get along before it’s too late? They are family, after all, and they’re both in their seventies. More importantly, they represent two distinct but equally important aspects of the band, both of which were essential to their original success: the creative genius represented by shy and reticent Wilson, and the promoter’s instinct personified by outgoing, flamboyant Love. Why not celebrate them both … together?